Tablón blanco: Practica de ser Exprésate I Capítulo 1 PARTE I. 4 Guadalupe is from Argentina. Guadalupe es de la Argentina. You (formal) are my teacher (female). Usted es mi profesora. You (familiar) are not from Chile. Tú no eres de Chile. Andrés and I are from the United States. Andrés y yo somos de los Estados Unidos. Its 11:00pm. Son las once de la noche. 5 You (familiar) and I are classmates. Tú y yo somos compañeros de clase. You all are from Spain. (in Spain) Vosotros sois de España. Its not 1:00! ¡No es la una! 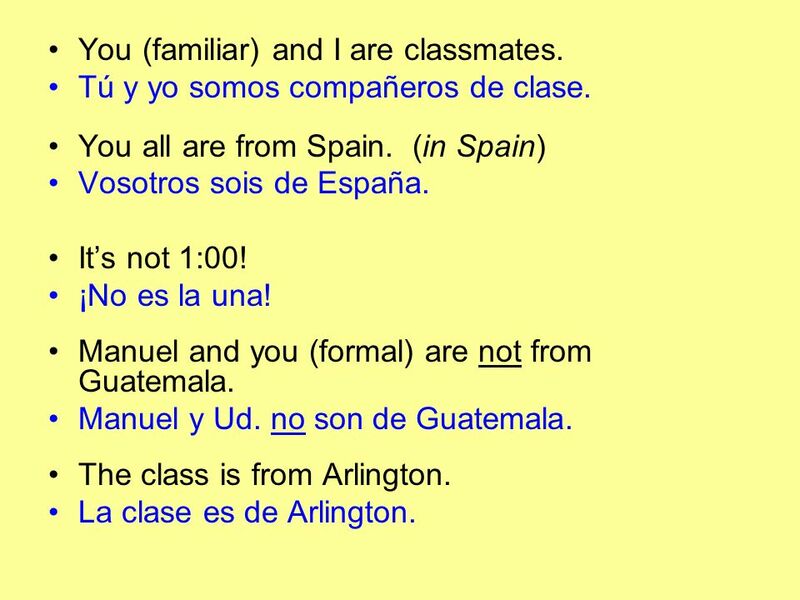 Manuel and you (formal) are not from Guatemala. Manuel y Ud. no son de Guatemala. The class is from Arlington. La clase es de Arlington. 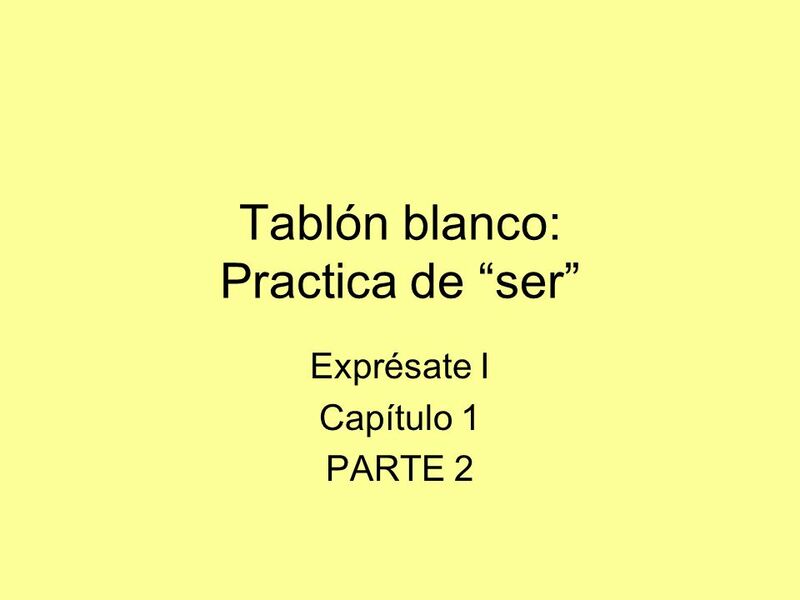 Descargar ppt "Tablón blanco: Practica de ser Exprésate I Capítulo 1 PARTE I." Ser means to be It can be used to: Identify yourself and others Date Origin (where something comes from) Nationality Time Personal description/profession. ¿SER O ESTAR? SER and ESTAR are irregular verbs in the present tense. Both mean the same in English to be. So, when do we use them? SER To describe a person. ¡Bueños días, estudiantes! Do Now: 1. Translate the following sentence into English: Hoy es lunes y mañana es martes. 2. Translate the following two sentences. 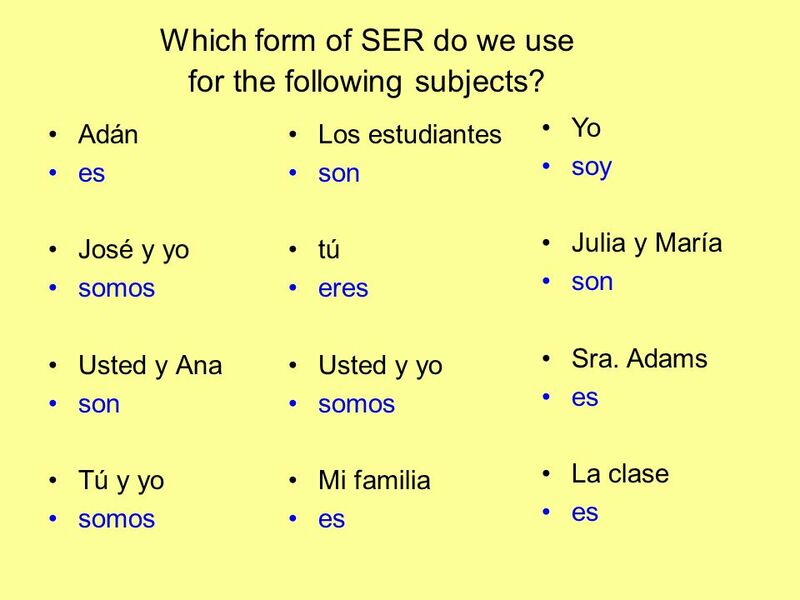 SER and subject pronouns Ch 1.1. Subject pronouns Subjects – do the action of the verb –Located in the subject of the sentence Pronouns – take the place. Gramática 2.1. Prior Knowledge The Conjugation of the verb Ser. CONJUGATE SER IN THE PRESENT TENSE. SER = TO BE It can be used for showing~ Date Occupation Time Characteristics (physical/personality/nationality) Origin.